Recently, I had the opportunity to interview British designer Tom Dixon for T Magazine. We spoke about his presentation at this year’s ICFF, which featured his new INDUSTRY line, the first in a series of limited-edition, self-published books, and a hands-on booth called Flash Factory. And, most interestingly, Dixon revealed his thoughts on the next phase of the design industry. Click here to read The New York Times “The Moment” story! Clear Magazine Issue 34 Now Online! 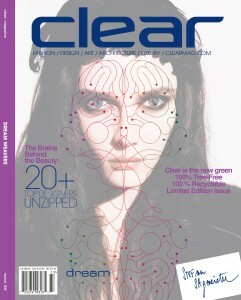 Clear’s digital winter issue is up online now at www.clearmag.com. We’re really excited – and I’m personally pretty proud – to have collaborated with Designer of the Year Maarten Baas on the cover for the special Design Miami/Art Basel issue! In addition to Mr. Baas, the new issue features profiles of and new projects by the likes of Marcel Wanders, Konstantin Grcic, Anna Sui, Yves Behar, Front Design, Mariko Mori, Theo Jansen and many more! Clear Magazine‘s latest issue, “Dream Weavers,” debuted at Mercedes-Benz Fashion Week in New York this past week. In honor of the event, Clear produced a collector’s edition, tree-free, 100% recyclable fall issue, and it’s being distributed throughout the week at related venues: in Tents at Bryant Park, and at hotels and galleries throughout the city. The limited-edition issue was printed on YUPO® synthetic papers, and was printed by Tepel Brothers Printing. Also exciting to note: designer Stefan Sagmeister co-designed our cover wrap (above), and there’s a slew of great stories inside, featuring stars like Stefan Sagmeister, Issey Miyake, Hussein Chalayan, Yigal Azrouël, Matthew Williamson, Ross Lovegrove, Barbara Bui, Todd Bracher, Cappellini, Terence Koh and more. Pick one up, or visit clearmag.com for more info. And check out my latest reviews plus interviews with Sagmeister, Miru Kim, Ross Lovegrove and Todd Bracher in the issue or on the writing samples page here (in the next few days). Thanks! 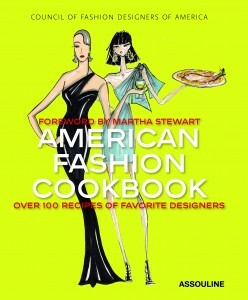 In honor of Fashion Week in New York, I just reviewed Assouline‘s new cookbook – American Fashion Cookbook: 100 Designers’ Best Recipes – for BehindtheBurner.com. The book features designers favorite recipes, along with original illustrations, by the likes of Diane von Furstenberg, Isaac Mizrahi, Carolina Herrera, Donna Karan, Tory Burch, Derek Lam, Nicole Miller and many more. The site’s also featuring a handful of the designer recipes from the book throughout the week. Check it out at BehindtheBurner.com! Now, Fairey plans to unveil a new project at The Fountainhead Residency (an artist’s studio program in residential Miami) at Art Basel Miami Beach in early December. 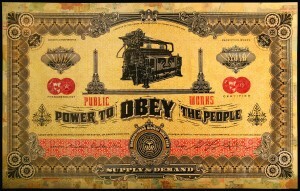 “The Public Works: A New Mural Project” will be a site-specific mural consisting of a barricade structure covered with the Fairey’s signature, multi-layered portraits of counter-cultural revolutionary figures and propaganda style imagery. 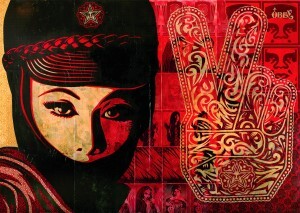 The blank canvas of the barricade will provide a significant expanse for Fairey to develop a cohesive series of images. The project is being produced by Country Club, a gallery with locations in Los Angeles and Cincinnati, in partnership with the Miami Art Museum and The Fountainhead Residency.